Cuxhaven leaving the port of Gdynia. On November 24, 2016, after launching, a partially outfitted hull of a trawler built to order of Myklebust Verft AS, Kleven group, was towed out of a graving dock SD II. The hull, towed by Fenja, reached Norwegian destination late November. Partially outfitted vessel, newbuilding no. Myklebust NB 392, built at Crist SA yard in Gdynia, with weigh of over 1700 t, was delivered to the Norwegian yard in quite high extend of outfitting. The ship was assembled with 41 sections forming six big blocks. When the contract signed by DFFU and Kleven was revealed in June 2015, the two sister fishing vessels (NB 392 and NB 393) were scheduled for delivery in February and June 2017. Crist yard has recently announced the delivery of the second hull for Kleven and DFFU (NB 393) “within short time “. The ship is to be named Berlin. 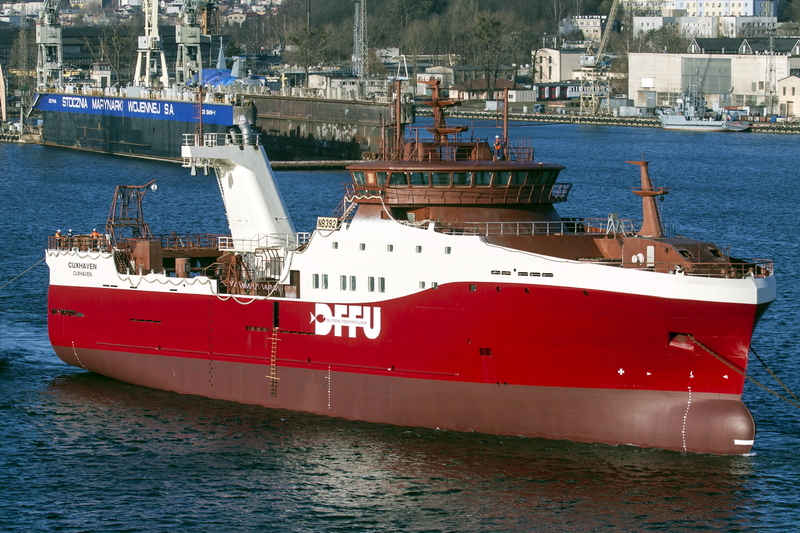 The unit delivered by Crist (NB 392), to be named Cuxhaven, is a stern trawler contracted at Kleven by German based DFFU (Deutsche Fischfang-Union), subsidiary of Iceland’s major seafood company Samherji. She will be able to fish both with bottom and pelagic trawls. There are places in 23 cabins foreseen for the maximum crew of 35. It is being built to NVC 374 WP design developed by Rolls-Royce. 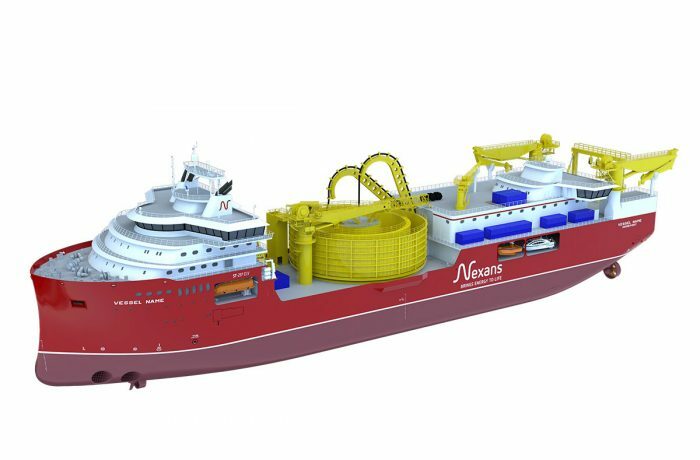 The vessels of NVC 374 WP design will be 80 m long and with hulls of ICE 1A* class, and equipped with a wide range of Rolls-Royce equipment, including main engines, thrusters, automation, winches and the fuel efficient Wave Piercing design. 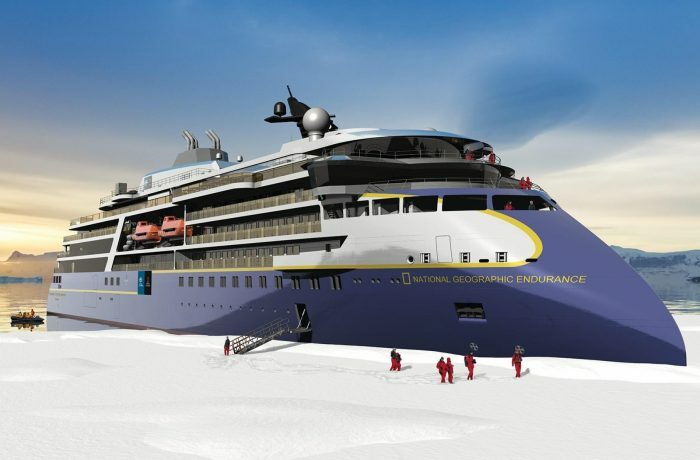 Operational efficiency, low emissions, crew comfort, safety and excellent sea-keeping capabilities have been the main considerations in the development of the ship design and equipment package. Both vessels will be equipped with Rolls-Royce’s latest B33:45 engine. The vessel encompasses an onboard factory for the production of fish filets, and has a storage capacity of 1,400 m³. There’s also a 550 m³ large packaging and freezer room on deck. 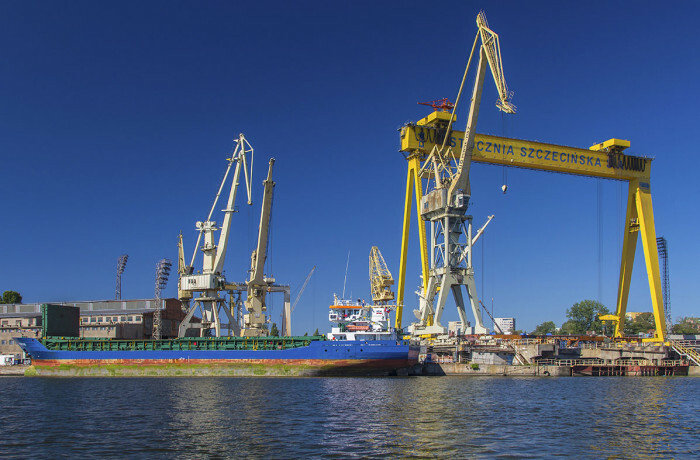 It is understood that another two trawlers of similar design, that Kleven group has in their orderbook, will also have the partially outfitted hulls built at Crist, Gdynia, Poland. These will be Emeraude (NB 395) and Kirkella (NB 396). Emeraud is destined for Euronor (Compagnie Des Peches Saint-Malo S.A. & SAS Comptoir Des Peches D’Europe Du Nord) of France and Kirkella will be delivered to Pescuera Ancora SL of Spain, both associated with Samherji.